ePublishing Knowledge BaseePublishing Knowledge BaseePublishing Knowledge Base Creating and Managing EventsHow do I create custom event details that will appear on my event microsite? Publishers that want a microsite or subsite to market their events need to first set up custom event details. This removes the need to create a page using the Page Manager or host pages on third-party servers or websites. Note: Not all ePublishing websites have this functionality yet. Please ask your Solutions Manager if you have questions. 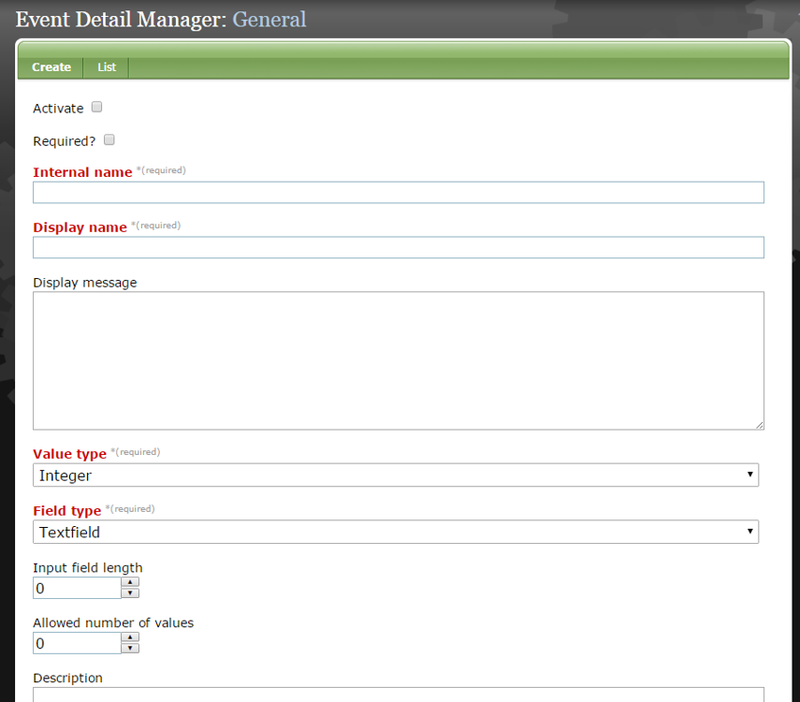 The Event Detail Manager controls the creation of the fields that display on your microsite. If you have questions about this, please contact your Solutions Manager. Important: You will need access to the Sys Admin > Event Detail Manager. Talk to your systems administrator to get this privilege added to your role or as an individual privilege in the User Manager. To learn how to set up an event that uses these custom event details in your Event Manager, read this article: How do I create an Event? 1. Open the Event Detail Manager. Find it under Sys Admin on your dashboard. If you need access to the Event Details Manager, please talk to your systems administrator. 2. To create a new custom event detail, select Create & Edit. The Event Detail Manager will open. Zoom: To create a new custom event detail, select Create &amp; Edit. The Event Detail Manager will open. To determine the order of the event detail navigation for your custom events (such as the navigation items shown in the image in step 29), your site administrator can update the order in the Sys Admin Event Detail Manager by dragging and dropping the fields. 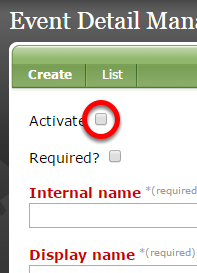 Contact ePublishing to reset the system to use the updated order of the custom event fields. This is best handled as a Help Desk ticket. The order will affect the landing pages of all events tagged with that event classification. 3. If "Activate" is unchecked, it will be visible when editing the Custom portion of your Event in the Event Manager. 4. If "Required?" is checked, anyone setting up an event MUST enter content to this section or they will not be able to save any changes when customizing their landing page. 5. Internal Name is required. This should be a short descriptive name in lowercase about this section of the event landing page. For example: directions or speakers. 6. Display name is the title of the section. It is required. It will appear under the event's logo and will allow readers to navigate to any content associated with this section on the event page. 7. The Display message will not appear on the event landing page. Zoom: The Display message will not appear on the event landing page. It is there to give you a space to add instructions to your team on what it should add in this section when setting up the event. This is not required. This will only appear in the Event Manager under Custom. 8. Select a Value Type. Zoom: Select a Value Type. 9. Select a Field type. Depending on which type you select here, different options will appear. Here's an example of a Textfield selection. Zoom: Select a Field type. Depending on which type you select here, different options will appear. Here's an example of a Textfield selection. Textarea = Block of text with no upper limit on characters. Selection = Multiple defined selection for the event registrant to select. This uses the Select box form field. Checkbox = This uses checkboxes. An event registrant can select a set number of options. Radio button = This uses radio buttons. An event registrant can only select a single option. 9.1. *** And here's what appears when you select Checkbox. Zoom: *** And here's what appears when you select Checkbox. 9.2. After you select your Field type, you will be prompted to fill out additional fields. Input field length: When shown, define how many characters you will allow to be input into that field. If left empty or unchanged, it will be 0. If 0, the admin tool will not save or accept any values typed into this field when someone is registering for an event. The Max number of characters allowed is 255. Allowed number of values: When this option is available, enter the max number of entry fields to appear on the Event Manager > Custom section for admin tool users. Not all fields need to have data unless the Required? checkbox is selected when you first set up this Custom Event Detail. If selected, all fields are required. For Selection and Checkbox field types, the "allowed number of values" will determine how many individual selections are permitted for the admin user before an error message occurs. Validation pattern: This is for advanced users only. This allows you to use regex (regular expressions) to set a validation pattern. This works with the field: Validation failure message, to validate submitted entries. For questions on this, please look to tutorials available online or books on the subject. Validation failure message: As noted above, this works hand-in-hand with the validation pattern field. Entries here should be short, but useful, so that the user knows what type of content will be validated. For example: "Please enter in all caps," or "Please remove all punctuation or special characters." 10. Assign a Classification or Classifications for the Event type that will use this custom field. For example, "Directions" would only apply to a Live event, not a Webinar, so you only want it to appear for event types that are relevant. Zoom: Assign a Classification or Classifications for the Event type that will use this custom field. For example, &quot;Directions&quot; would only apply to a Live event, not a Webinar, so you only want it to appear for event types that are relevant. More than one can be selected. Assigning a Classification is required. 11. For Textarea or Textfield, a "default value for field" will appear under the Classification. This is optional. Zoom: For Textarea or Textfield, a &quot;default value for field&quot; will appear under the Classification. This is optional. If you add text here, it will appear by default when your team is setting up events. 12. When Checkbox, Selection or Radio Button are selected as the Field type, the options available will show under Classification. Zoom: When Checkbox, Selection or Radio Button are selected as the Field type, the options available will show under Classification. 12.1. To add an option for selection, type it into the Option Label box. 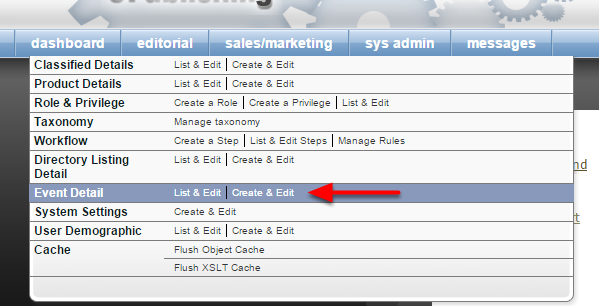 This allows the admin user setting up the event to select the correct option for that event. For example, which hotel the event is held at. Zoom: To add an option for selection, type it into the Option Label box. 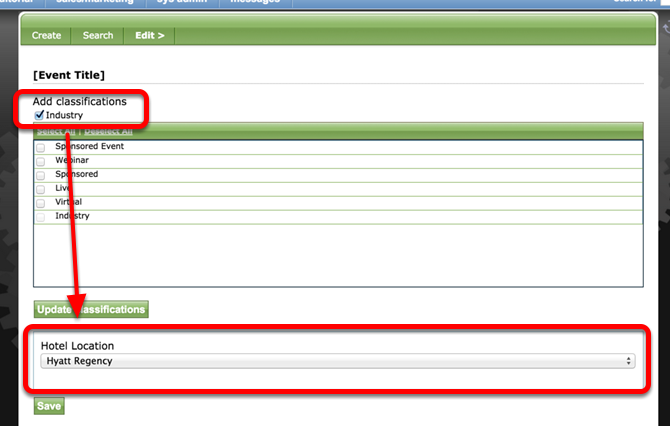 This allows the admin user setting up the event to select the correct option for that event. For example, which hotel the event is held at. Type in the name, and click Add more on the right if you have additional choices. 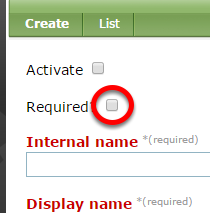 Select the box under Default if you would like it to default to one of the selections when setting up an event. IMPORTANT: When entering multiple option names/values, the values are saved in the order entered. Use the icon to the left of the name / value pair to drag and drop to a different position, if desired. 12.2. The Option Value is the number saved to the database when that option is selected. This value matters for any third-party integrations that may need to make use of the data saved here. 12.3. This is how the Option Labels and Option Values show when setting up the custom event details under Directory Listing Manager > Custom. Note the dropdown menu for hotels that appears when the classification "Industry" is selected. 13. Click Create or Save. 14. To create a new Event or modify an existing one, return to the Event Manager. You will find the event details you just created under Edit > Custom + the relevant Directory classification. Learn more about setting up events in this article: How do I create an event? Prev: How do I add new sections/navigation to my event's landing page? 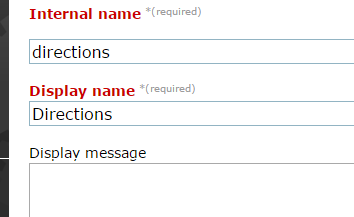 Next: How do I create a registration form for an event?